The design of MBBR Biofilter media elements is only one part of the story in an MBBR filter, or any biofilter for that matter. Other factors such as dwell time, hydraulic loading rate, air and water distribution, media velocity and oxygen transfer all determine overall effectiveness and removal rate of nitrogeous waste. There is a lot more involved in design any biofilter, but especially an MBBR, than just throwing in media and aerating it. Pure Aquatics have identified specific removal rates for our media the PA-X1, PA-X3, PA-X5 and HEL-X FLAKE, and have optimised its performance through identifying design parameters in biofilter design. Although surface area plays a role in removal rates in MBBR’s, it isn’t all that is involved. Please do not hesitate to contact us with your MBBR or other biofilter requirements. PAX MEDIA NOW EVEN HIGHER SURFACE AREA!!!! Through many years of biofilter design an optimisation, Pure Aquatics have identified shortfalls in some MBBR carrier element designs. Although surface area does play a part, having a high surface area (when considering conventional MBBR carrier element design) it doesn’t necessarily mean it will process more TAN. Waste buildup and biofilm thickness, especially in a filter solely designed for nitrification is of the greatest importance, and so a balance between surface area, void space, oxygen transfer and water flow across the media surfaces all determine the medias efficiency. The PAX1 media has a large surface area with a good balance of protected surfaces for maximum biofilm development, whilst still allowing exfoliation of older biofilms by both physical contact with other carriers, and water flushing of the internals of the media. Together with our MBBR design and construction parameters, Pure Aquatics can optimise MBBR operation for maximum TAN removal and longevity in performance. To boost your MBBR’s performance, why not also consider the addition of HEL-X FLAKE? PAX3 offers a larger media with openings large enough to withstand blocking in system that have higher waste loads. PAX5 MBBR media offers a much better surface area compared to medias of a similar diameter. 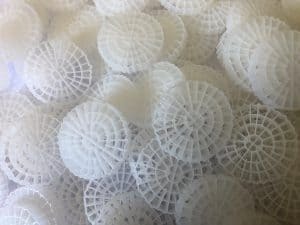 Due to the much smaller opening size, reactor design, pre filtration, aeration and mixing must be optimised to ensure thin biofilms on the media are maintained. Pure Aquatics can assist you with the best equipment and design for the task. This media is best suited to applications where the reactor has larger opening sizes in the outlet screen/strainer but the water is cleaner. 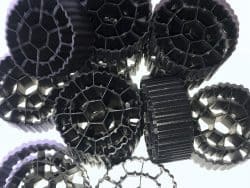 Hel-X medias are a powerhouse in MBBR carrier design, from conventional style carrier elements to trickle filter media and the incredibly high surface area FLAKE, there is a media for every application. The HEL-X FLAKE boasts a surface area of approximately 3250m2/m3, with TAN removals equivalent for conventional carriers per m2 of surface area. 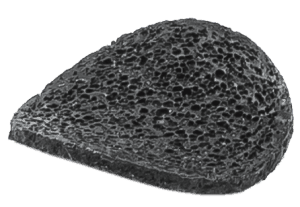 The HEL-X company has invested significant time and resources into research of their flake product, resulting in a cost effective but equally impressive removal performance compared to other high surface area biomedia types. Pore size, circulation, biofilter design and overall substrate concentration and diffusion across the biofilms determine the removal rates in the system, and this goes hand in hand with surface area. The volume of surface area and pore distribution within and one the carrier element is only one part of the equation, too much porosity, size of pores and not enough cleaning of the media can negatively impact waste removal in some cases. HEL-X FLAKE can be used solely in a biofilter, or, as we prefer to use the media, as a mix in certain ratios to boost biofilter removals and result in lower effluent concentrations. As most MBBR’s in Aquaculture are only filled to 50% void volume, HEL-X FLAKE can be deployed to fill the further 10% of the reactor volume (totaling 60%) to boost biofilter TAN removal. 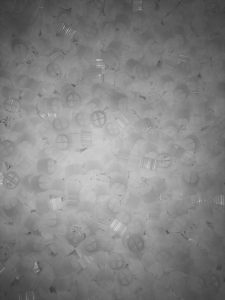 HEL-X FLAKE is available in either a black re-granulate (recycled) product, or a virgin (white) HDPE. Pure Aquatics represent HEL-X in Australia and New Zealand and distribute on demand other carrier element types from HEL-X should you have a specific requirement.